Breaking: GOPers Cave, Will Re-Open the Government Without Border Wall Funding! 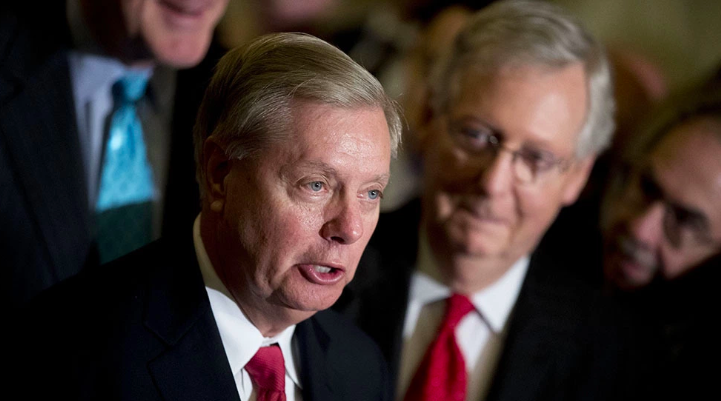 Lindsey Graham just became the fourth Senate Republican to openly support the left's plan to open the government without passing additional border security funding! That would give the Left all the votes they need to block the border wall project. If the GOP caves and re-opens the government right now, the wall will never get built. You must fight back. It is now or never! Please, send your instantly delivered hard-copy letter to Congress right now (below) and FORCE them hold the line and pass full border security funding, or else be removed from office! A new poll shows that the public's support for a border wall is higher than it has ever been. Many of your colleagues on the left are starting to read the tea leaves and are abandoning their party's position that border barriers are "immoral" and "ineffective." If you want to keep your job, then you must approve the President's border security plan and appropriate the necessary $5.7 billion in funding. The only question I need to ask is, do you love the country more than you hate the President? If you love the country, you will end this shutdown by appropriating the funding. The Federal budget is $4.4 TRILLION. What President Trump is asking for is the equivalent of $57 out of a $44,000 budget. Americans are suffering from this shutdown. But even worse, Americans are suffering from our open borders. Every Congress over the past four decades has tried and failed to secure the border. You have the power to fix all of this, but only if you put country over politics. National security isn't a "compromise." The border is either secure or it isn't. If you will not honor your oath and appropriate the funding to secure the border, then I will have no choice but to dedicate my entire being to remove you from office.